The Toddler Playground is open every day weather permitting. 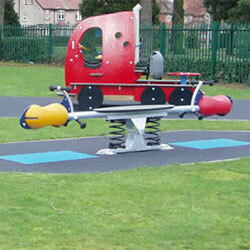 The equipment is suitable for children up to the age of 8. Work commenced in the summer of 2006. Funding was provided by WREN, SURESTART, SKDC (106 agreement monies), Wyndham Park Bowls Club, and Wyndham Park Forum. Hard work was undertaken by teams of offenders under community orders with an unpaid work requirement, with the National Probation Service, supervised by Gordon Storey.Equipment was designed and installed by KOMPAN, the safe surfacing by ABACUS. The playground opened for business on 15th December 2006 with an official opening by Cllr Frances Cartwright on 10th January 2007.